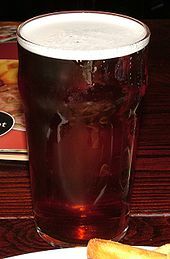 The term "bitter" has been used in England to describe pale ale since the early 19th century. Although brewers used the term "pale ale", before the introduction of pump clips, customers in public houses would ask for "bitter" to differentiate it from mild ale; by the end of the 19th century, brewers had begun to use the term as well. During the 20th century, bitter became the most popular type of draught beer sold in British pubs and has been described as "the national drink of England". In Scotland, bitter is known as either "light" or "heavy" depending on the strength, colour and body. Bitter is traditionally cask conditioned and either dispensed by gravity through a tap in the cask or by a beer engine, although in recent decades, bitter has also been pasteurised and carbonated, or sold in bottles or cans, which affects the flavour. Despite the myth, bitter should not be served warm, but at "cellar temperature" of 11° to 14° Celsius. The popularity of craft brewing in North America has led to British-style bitter being brewed there since the 1980s. Bitter belongs to the pale ale style and can have a great variety of strength, flavour and appearance from dark amber to a golden summer ale. It can go under 3% abv — known as Boys Bitter — and as high as 7% with premium or strong bitters. The colour may be controlled by the addition of caramel colouring. British brewers have several loose names for variations in beer strength, such as ordinary, best, special, extra special, and premium. The difference between an ordinary and a best bitter is that one particular brewery's best bitter will usually be stronger than its ordinary, and premium bitter stronger again. Hop levels will vary within each sub group, though there is a tendency for the hops in the session bitter group to be more noticeable. Light ale is a low alcohol bitter, often bottled. Strength up to 4.1% abv. The majority of British beers with the name India Pale Ale will be found in this group, such as Greene King IPA, Deuchars IPA, Flowers IPA, Wadworth Henrys Original IPA, etc. IPAs with gravities below 1040° have been brewed in Britain since at least the 1920s. This is the most common strength of bitter sold in British pubs. It accounted for 16.9% of pub sales in 2003. Strength between 4.2% and 4.7% abv. In the United Kingdom bitter above 4.2% abv accounted for just 2.9% of pub sales in 2003. The disappearance of weaker bitters from some brewers' rosters means "best" bitter is actually the weakest in the range. Golden or summer ale has an appearance and profile similar to that of a pale lager. Hop Back Brewery brewed one of the first, called Summer Lightning, in 1989. ^ Pattinson, Ron (2004). "Beer, ale and malt liquor: old British beer terminology". Xs4all.nl. ^ Oliver, Garrett, ed. (2012). The Oxford Companion to Beer. Oxford University Press. pp. 129–130. ISBN 978-0-19-536713-3. ^ "Caramel color: the science and art" (PDF). DDW Global. 2001. Retrieved 25 August 2010. ^ "Michael Jackson's Beer Hunter - Beer Styles: Light Ale". Beerhunter.com. Retrieved 22 March 2014. ^ "Brewing records". London Metropolitan Archives: Whitbread and Barclay Perkins. ^ a b "Statistical Handbook". British Beer and Pub Association. 2003: 21. ISSN 1475-3545. ^ "Hop Back Summer Lightning " Beer Culture with Des de Moor". desdemoor.co.uk. Retrieved 5 June 2010. Wikimedia Commons has media related to Ale (beer).